A unique feature of the Montessori classroom is the ready availability of snacks. We place healthy, easy-to-eat snacks at the children’s level so that they can help themselves when they are hungry. There are several elements to this routine that works well for the developing child. After snack, children are responsible for cleaning up for themselves. This is a central feature of Maria Montessori’s method - respect for one’s environment. Children are introduced to the cleaning station and are guided towards how to throw away trash, clean dishes, and put the dishes away. Preparing the environment is easy. Teaching the child how to manipulate the food comes over time. The real mastery of this work is guiding children in understanding their hunger cues. By limiting the times that snack is available, we introduce the child to patience. We help them to grow comfortable with the idea that they will not be able to eat anytime they would like. However, by providing healthy options at reasonable times, we honor the child’s innate desire to eat when hungry. Snack work is not forced or recommended; it’s merely available. Sometimes children choose to do the work without the eating, and that is ok too. In this case, we talk to the child about taking their work home. Trusting the process of the Montessori method takes a lot of faith. Working with toddlers increases my faith in the method. This week I witnessed a toddler on her way to mastering the skill of handwashing. In the process, I also watched a younger toddler observing her work. I have faith that one day, he can master this skill as well. 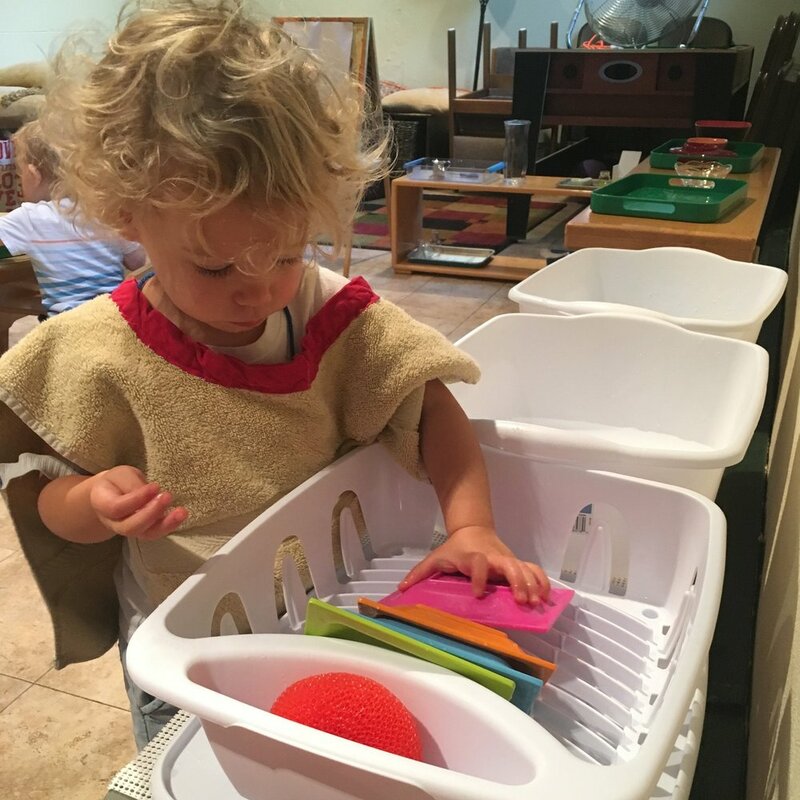 Through the spills, falls, and sometimes tears, my faith in the Montessori method continues to grow knowing that these important skills are being mastered. The practical life skill of handwashing is introduced to the child at 18 months old. Supplies include a bowl, pitcher, soap dish with bar soap, apron, and hand towel. You will notice that we practice this skill at a table of proper height for the toddler. Doing this makes it easier for the student to focus on the task at hand without the complication of a step stool or awkwardness of a sink. Child puts on an apron. Child takes pitcher to a water source and fills the pitcher with water. They then walk it back to the handwashing table. Child pours water into the bowl. Child wets their hands in the bowl. Child takes soap and lathers their hands. Child dries their hands with the hand towel. Child pours dirty water into a bucket. Child walks dirty water bucket to bigger bucket. Child pours the water into the bigger bucket. Child walks empty bucket back to the dishwashing station. Beyond the obvious need to clean one’s hands, this work helps children to focus, concentrate, and practice hand-eye coordination. Importantly, it also helps children to learn patience. This is my favorite Montessori activity to observe toddlers to master. I believe it is very important for the children to go outside everyday. Unless it’s below 34 degrees or pouring rain, children and adults can enjoy the outdoors in almost any type of climate as long as they have the proper gear. In early April we were surprised by a heron who took residence at the pond of our local park that we walk to daily. As the toddlers and I walked around the pond, we practiced being very quiet so we could see the heron walk and fly. It was a great opportunity to observe nature and learn about a bird that is not a usual resident at our park. One day as we approached the park our assistant, Ms. Lily, said, "The heron is eating a fish." As I looked over, there it was with a fish in its beak. The heron was trying to eat it by repeatedly picking it up and throwing it on the shore. The ability of these young children to observe quietly and focus for 20 minutes was only made possible because of the prepared environment they have been exposed to for the past seven months. Allowing toddlers to focus and concentrate without interruptions helps them to be still, focused, and concentrate on the things that are around them. Our friend, the heron, continues to make occasional visits to the pond. When the children see it they automatically quiet themselves and stop to observe. Why are the scissors on the table? You may notice that the Montessori classroom includes materials that are easy to reach...including scissors. This is a purposeful choice made in both the toddler and primary environments. We ensure toddlers are taught how to use scissors safely. We start by introducing each child to the scissors and instructing them on proper handling. The initial cutting works are not complex, with children simply cutting small pieces of paper or easy-to-hold foam strips. We find these works give children the opportunity to feel mastery over the act of cutting. As skills develop, instruction for cutting activities become more intricate, such as in flower arranging. In this way, we connect the practical life skill of cutting with an enjoyable activity that brings joy to the community. Although scissors remain available to students, we expect them to be used only for the identified work. They remain on the tray of each activity and we expect the child to use them only in this way. And of course, guides in the room are able to direct and redirect children in the proper handling of the tool. If you choose to practice using scissors in the home, we recommend using a high-quality pair of child-size scissors that match your child's handedness. We made fruit smoothies today and last Friday too, I think we will make a tradition out of it. I find that making smoothies with the children serves three primary purposes: nutrition, practical life work, and exploration. Of course, we know smoothies are an easy way to get fruit into your children's stomachs. And they are delicious! If you are bold, you can incorporate vegetables into your smoothie too. When we work together to make the smoothie, the children patiently take turns contributing to the work. We measure and decide together which ingredients go in. The most interesting part is watching the blender make changes to the produce size, shape, and color. We talk about the food changing from solid to liquid. Some of the children really enjoyed these smoothies but others have their doubts. We know they are sweet and delicious, but sometimes the sensory processing of the cold drink feels strange. If you add green vegetables, the green color can really deter some of our friends! If you make smoothies at home but your child is not interested, continue to encourage your child to try the drink. Sometimes it takes several tastes before a child is ready to commit to the colorful, cold refreshment. Add all ingredients into the blender. Blend on high until the smoothie swirls at the top. If the blender stalls, add juice or water until it moves again. Pour and enjoy right away!